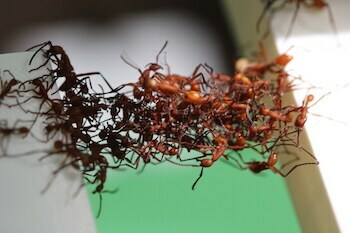 Social structures: new insights into the living architectures built by Eciton army ants. The New World army ants in the genus Eciton link their bodies together to build complex, dynamic structures that perform a variety of functions for the colony. Such structures include fully functioning temporary nests called bivouacs, which house the workers, queen and brood inside tunnels and chambers made from the colony members themselves, and bridges, ramps, pot-hole plugs and scaffolding structures that allow foraging ants to move more easily through the environment. I will talk about my recent work conducted in Panama to understand more about how such bridge and scaffolding structures are built by these small, blind animals, using local information and self-organised processes alone, which may inform future designs for swarming robots.